This is a picture of a Hawk. 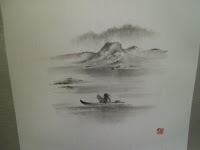 It is not clear or detailed, but the brushwork is very powerful. In some ways, too powerful to be displayed with a bonsai, but we will see if there are any at the convention that will match to this painting. It was drawn by Natsuko Horinouchi. I mounted the painting in a simple Fukuro Hyougu style, with a white cloth to help show off the black dots in the painting that to me represent snow and the dark image. I then finished it with a black plastic jikusaki and a Kon Hanging String. I know I have my ideas of how I will display it, but what do you think? This painting is a little too bold for the ABS convention, but I will take it anyway. The painting is not detailed, allowing viewer to imagine the details. It was painted by Natsuko Horinouchi. I used the distant mountain designs in the cloth to go along with the cliff in the painting. The red shike cloth places the scroll in the Autumn season. I completed it with the Kodai San Iro Kakehimo and plastic ivory jikusaki. 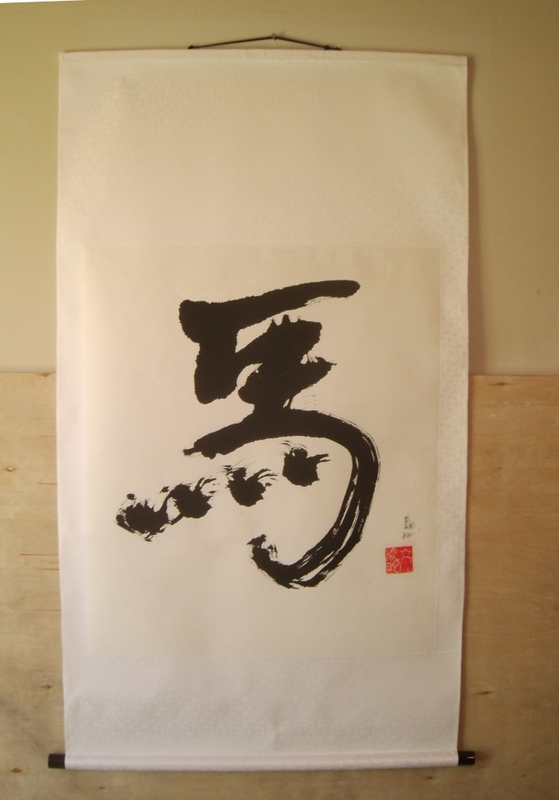 This is the calligraphy of horse by Richard Man a California Artist. He asked me to frame it in a Chinese style, so I selected a white cloth. Probably should have used a larger jikubou, but I did not have one. The scroll turned out nice and simple. This scroll is sold and is no longer available for sale. This scroll is also for the ABS For the Love of Bonsai convention in Saratoga Springs NY. This is specifically for my Bonsai Display Lecture on Friday. The artwork was painted by polish artist Mariusz Szmerdt. I asked him to do some themes specifically with Native American themes. This specific painting has an Iriquois Indian in a canoe. I have a specific Toko no Ma display in mind for this and will use it in my lecture for bonsai display. The scroll is in a Semi-formal Two Step scroll style called Nidan Hyougu. The cloth on the top and the bottom actually has faint horizontal stripes of alternating darker and red colors. I thought this was good for Autumn. The grey chuumawashi cloth has a purple which reminded me of morning mist. 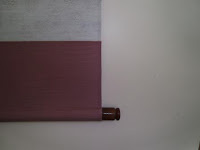 The scroll is completed with a Rosewood Jikusaki that is machined, and an Ouka Pink hanging string. If you have questions about having a commission scroll made please contact to me at sales@customjapanesecalligraphy.com or call to 801-254-6842. This is another Kakejiku for the American Bonsai Society exhibition in September of 2013. It is a painting drawn by Natsuko Horinouchi. It is painted to be part of a winter display, and is an Onaga or Magpie. It is very simplistic, which would allow the bonsai to take the primary position of the display. If you would like a commissioned piece, please contact to sales@customjapanesecalligraphy.com for more information. The scroll is done in an informal Maru Hyougu style and has a silver/gray cloth accented by a Navy flower karakusa (arabesque). The Ichimonji, (cloth bordering the painting) is a gold on gold flower karakusa. It is completed with a Navy Hanging string and black plastic Jikusaki. 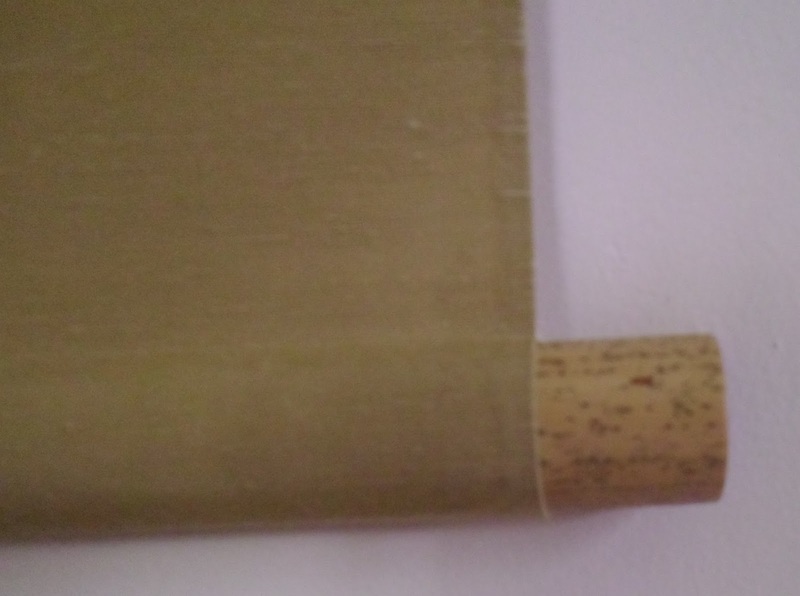 The simple style of the painting is reflected in the design and use of the other materials selected for this scroll. artist Natsuko Horinouchi. She really followed the example for this one quite well. It is a Shrike in monochrome, perched on a dried twig. 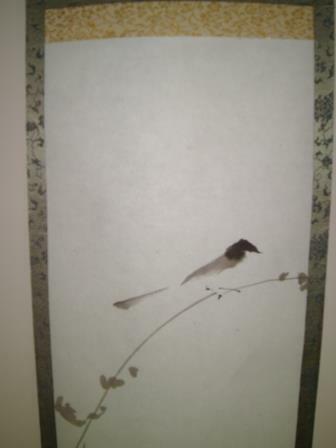 It is a very beautiful example of a fall season scroll for display with a bonsai, ikebana or sanyasou. The scroll is done in a three step style called Sandan Hyougu. The hashira or pillars surrounding the vertical sides of the artwork are very narrow, only 5 Bun wide. So this scroll could be considered a Rinpou Hyougu style as well. The Goldenrod on the top and bottom are a shike cloth and the chuumawashi is a green/gold with a smaller leaf karakusa (arabesque). 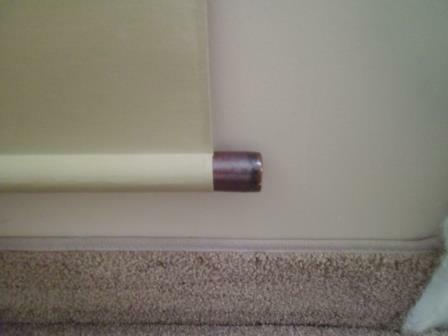 The Ichimonji is a kinran with a large gold flower pattern on a light tan color background. The scroll is completed with a Kincha (Brown) hanging string and a wooden jikusaki that was salvaged off of an old scroll. This gives it a more rustic feel. This scroll is sold and is no longer available. This is another scroll painted and framed specifically for the American Bonsai Society Convention in September at New York. I really like the way this one turned out. It has some beautiful features and is very easy on the eyes. This is a picture of a Mountain or Cold sparrow perched on a barren, thin tree branch. The painting is done by Natsuko Horinouchi. 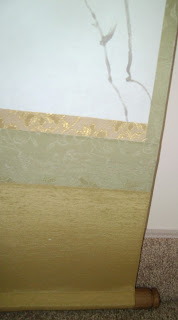 The scroll is done in a three step style called Sandan Hyougu. 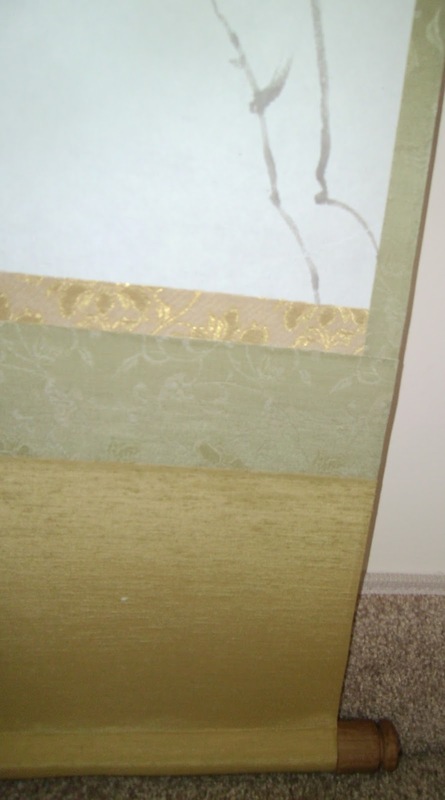 It has a Gold on white Ichimonji with a mauve color Chuumawashi and a khaki colored Ten/Chi. The colors are very harmonious and do not detract from the painting. The jikusaki is a ceramic piece with a color that is only slightly darker than the purple chuumawashi. The hanging string is a light gold color.